Two works have been published which substantially update long-standing views about nitrogen and crops. The first, Bender et al. (2013), points out that the whole nutrient balance of maize, and applications of NPK (nitrogen, phosphate and potassium) and micronutrients may well not have kept pace with their removal from fields – because of yield and harvest index – with modern varieties. While nitrogen (and NPK responses) are probably trialled regularly, other elements may not be. Their data show that a hectare of maize crop has no less than 286 kg of N, 202 kg of K2O, down to 80g of boron, and typically 60% of this is removed in the grain yielded by the crop. In the UK, a typical cereal crop would have c. 150 kg N /ha (http://www.ukagriculture.com/farming_today/fertiliser_data.cfm), pretty much what is reported as being removed in this paper. 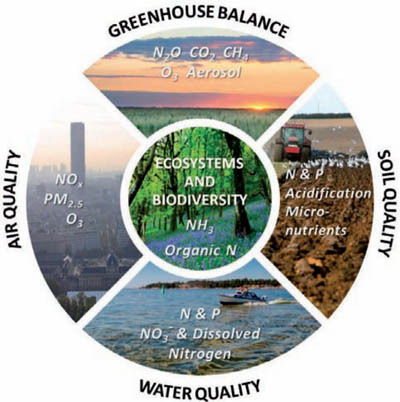 The second work gives a global overview of nutrient management and was published on 18 February 2013 as a report, Sutton et al., on behalf of the “Global Partnership on Nutrient Management and the International Nitrogen Initiative”. It concludes that “The world’s N and P cycles are now out of balance, causing major environmental, health and economic problems”, and, in agreement with Bender et al., “Insufficient access to nutrients still limits food production and contributes to land degradation in some parts of the world”. The report has a call to action as well: “A new global effort is needed to address ‘The Nutrient Nexus’, where reduced nutrient losses and improved nutrient use efficiency across all sectors simultaneously provide the foundation for a Greener Economy to produce more food and energy while reducing environmental pollution.” A clear cartoon of the nitrogen cycle is also given in the report, and is reproduced at http://blog.ecoagriculture.org/2013/03/20/our-nutrient-world_unep / : there has been some, although limited, discussion of the report in the blogosphere. I’m been very suspicious for years of figures like “over 80% of Nitrogen is in fact lost to the environment through runoff, erosion, and greenhouse gas emissions”. Obviously, in a steady state, 100% of the nitrogen is eventually returned to the atmosphere, and unlike carbon, there are no gigantic long-term stores like limestone (calcium carbonate, CaCo3) or fossil fuels (coal, gas and oil). But the Bender et al. paper shows 60% is actually removed for food use! Modern maize (Zea mays L.) hybrids coupled with improved agronomic practices may have influenced the accumulation and partitioning of nutrient uptake since the last comprehensive studies were published. The objective of this study was to investigate nutrient uptake and partitioning among elite commercial germplasm with transgenic insect protection grown under modern management practices. Plants were sampled at six growth stages and divided into four fractions for nutrient determination. Total nutrients required per hectare to produce 23.0 Mg ha–1 of total biomass with 12.0 Mg ha–1 of grain included 286 kg N, 114 kg P2O5, 202 kg K2O, 59 kg Mg, 26 kg S, 1.4 kg Fe, 0.5 kg Mn, 0.5 kg Zn, 0.1 kg Cu, and 0.08 kg B. A 10-d period (V10–V14) denoted the maximum rates of accumulation on a per day basis for dry weight (439 kg), N (8.9 kg), P2O5 (2.4 kg), K2O (5.8 kg), Mg (2.2 kg), S (0.7 kg), Zn (14.2 g), Mn (18.0 g), B (3.3 g), Fe (95.3 g), and Cu (3.0 g). Th e majority of total uptake occurred post-flowering for P, S, Zn, and Cu. Harvest index values of P (79%), S (57%), Zn (62%), and N (58%) were identified in the grain. These results provide much needed data on the nutrient uptake and partitioning of current hybrids, and provide an opportunity to further refi ne fertilizer method and timing recommendations for maize biomass and grain production. Any adverts below not associated with this website and giving no revenue! This entry was posted in Environment, Farming, Literature, Sustainability and tagged breeding, cereals, crops, cycles, fertilizer, nitrogen, nutrients, phosphate, yield. Bookmark the permalink.